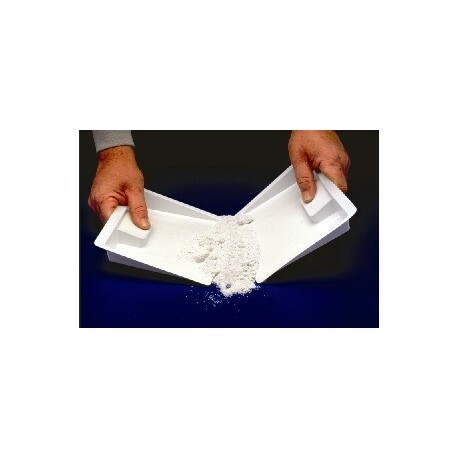 The WEDGE DUST PAN scoops up spilled chemicals that have been contained by an absorbent medium. This thin-edged, styrene pan effortlessly removes refuse for proper disposal. In most instances the 7" x 7-1/4" (178 mm x 184 mm) pan can efficiently handle the job. However, for larger spills, 2 pans pushed together will gather the spill more quickly. Inexpensive, disposable, and convenient, the Wedge Pan tapers from the front edge to a 1-1/4" (32 mm) depth. The recessed hand grip provides ample room for fingers and thumb for a sturdy grip. Sold in packages of 6.